The ▂M3 Medium is a gift Rank I Russian medium tank with a battle rating of 2.7 (AB/RB/SB). It was introduced sometime during Update 1.55 "Royal Armour". 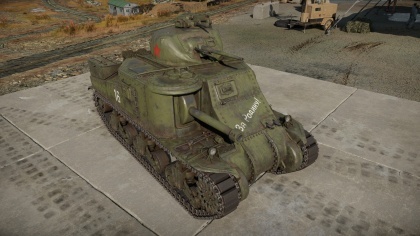 It was first obtained via the special event "Defender combined battles" in 20 February 2016 and has been occasionally available to be obtained since. It is virtually identical to the M3 Lee; the different name comes from the Russian designation of just "M3 Medium". Despite the tall profile, the "wedding cake" design of the turret has thick sloped armour, providing extra protection to make up for its height. Good for researching low rank tanks. In the February 2016 tournament "Defender Combined Battles", with the tank part of the Defender trophy for the top 100 players in each battle mode. 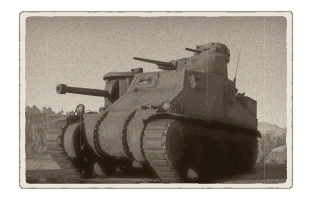 In the September 2016 "Tanker's Day" Special , where the M3 Lee USSR was available in the event's battle trophies. In the September 2017 "Happy tanker’s day!" event, the M3 Lee was available alongside the 5th Guards SU-76M to be obtained after five victories with Rank III or higher vehicles. This page was last edited on 16 March 2019, at 22:32.